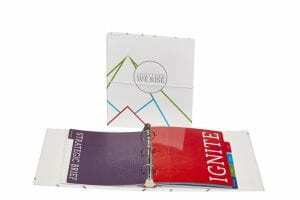 The ultimate organizer for printed collateral. 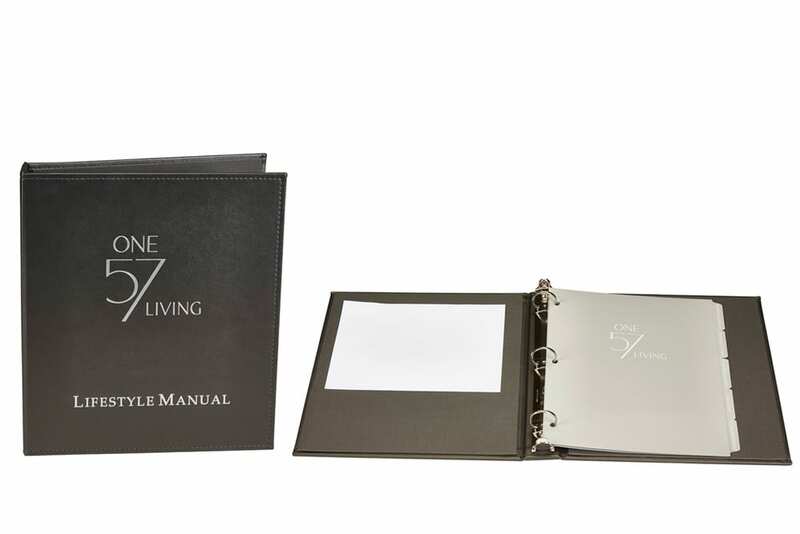 Most all of our binders and made-to-order using vinyl, cloth, leather, paper…and most any other material. 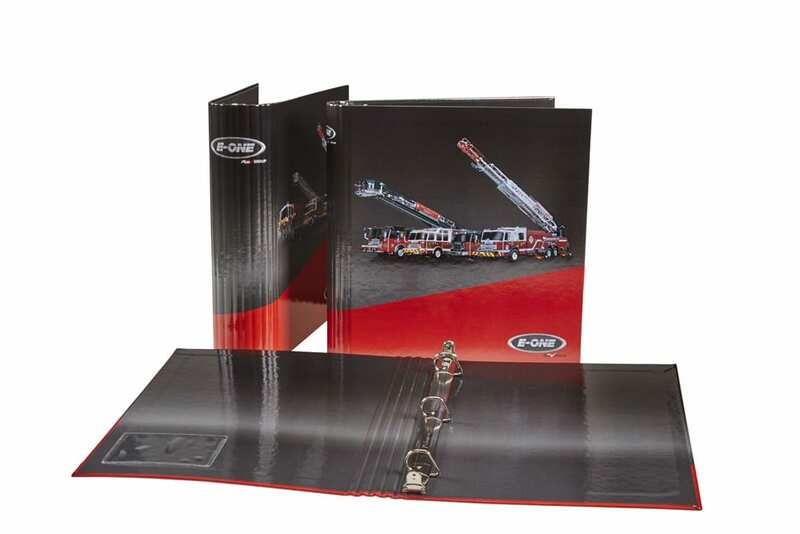 There are no limits to the creative possibilities in developing the perfect binder for your use. 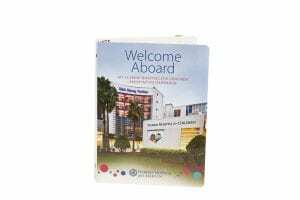 Turned edge landscape in-room directory binder. 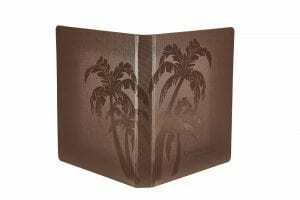 Thatch material is commercial grade wallpaper that is durable and easily cleaned. Laser etched wood medallion is mounted into pocket created on lower right hand corner. The interior is lined using French turned panels inside the front and back covers and the inside back cover has a finished turned edge pocket to hold collateral materials. Turned edge 3-ring binder with square corners. 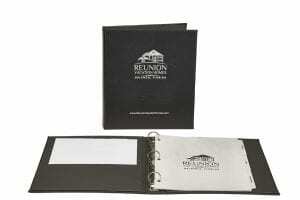 4-color print +matte lamination for outside binder. Inside is lined with vinyl coated paper to enable sealing a horizontal pocket inside the front lid. 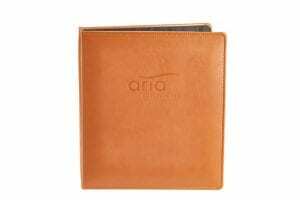 The notches in the horizontal pocket allow for slight expansion to accommodate materials inserted. Expanded/supported imitation leather sealed with perimeter stitching. Covers are padded and the logo is foil stamp/deboss on the front cover and spine. Oversized flip-over easel binder is made from black film vinyl that is heat sealed. 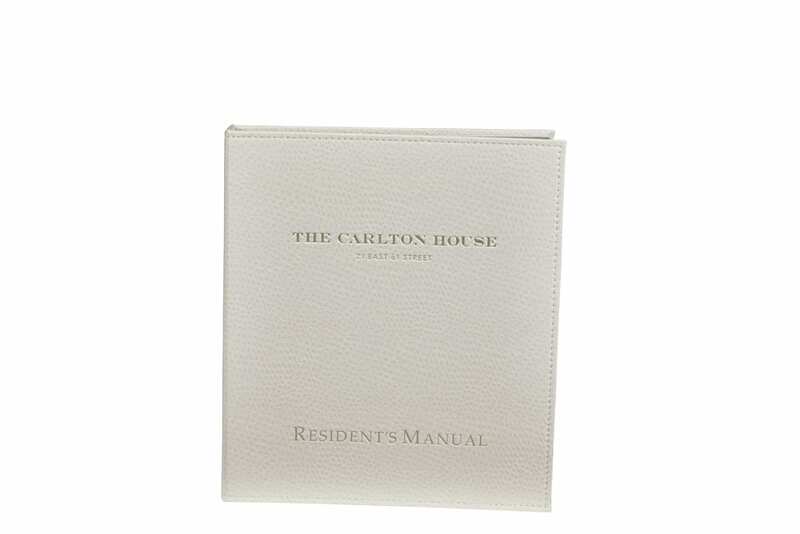 The frosty acrylic cover is etched with the resort logo. 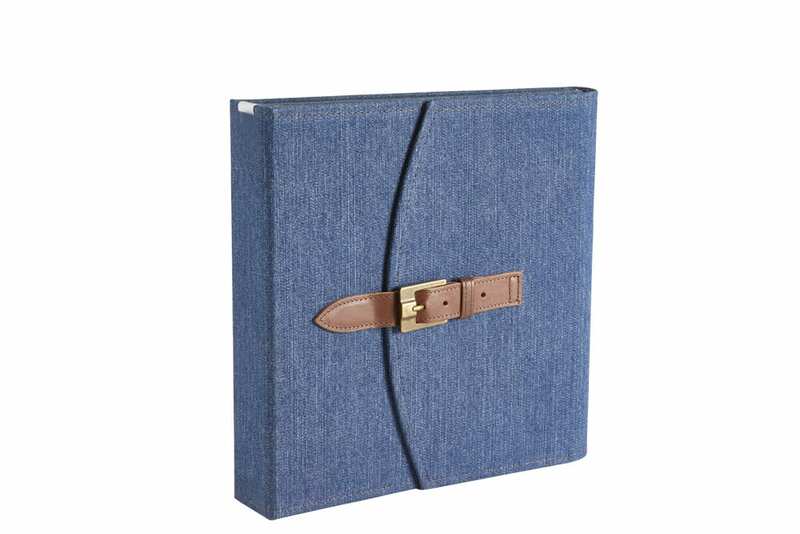 This custom turned and stitched 3-ring binder is covered with denim material. 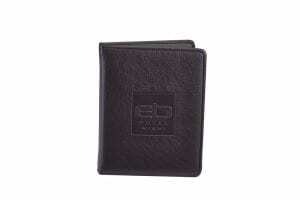 The leather buckle and clasp on the front cover are for decoration. 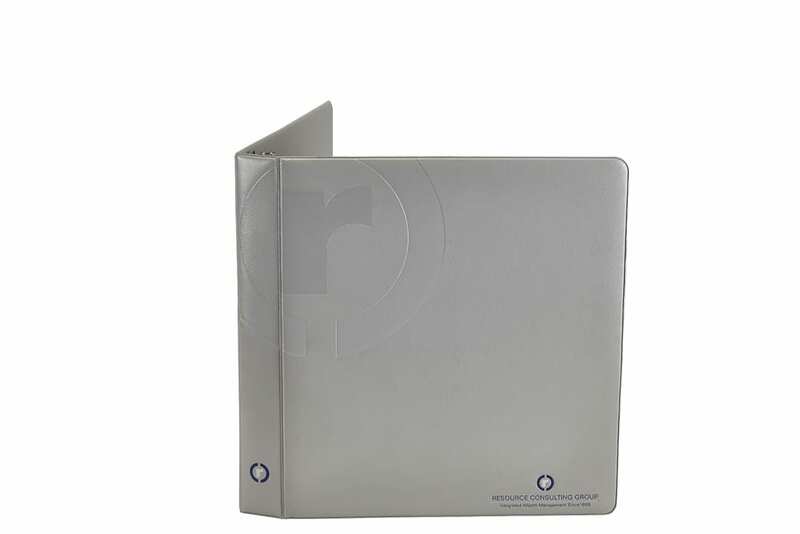 The binder flap is held in place with hidden magnets. 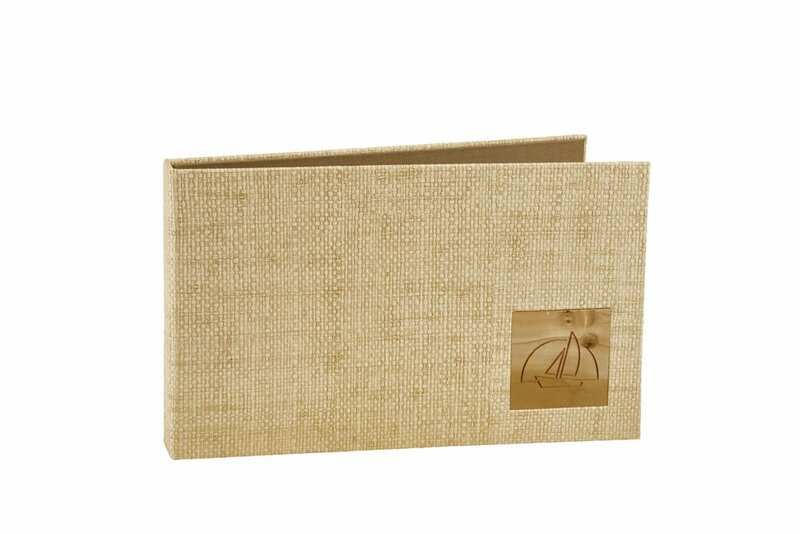 The spine has a custom woven tag with the clients logo sewn into the top edge binding. 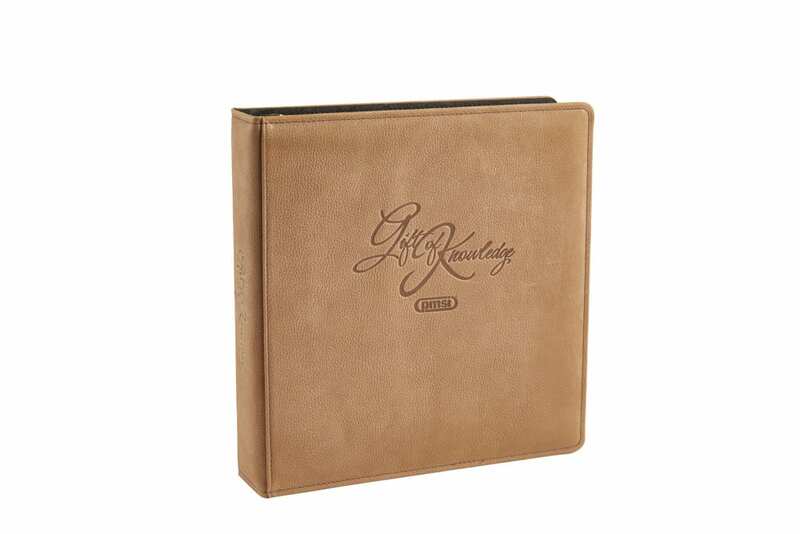 Full grain suede leather 3-ring binder with burnished logo on front cover. 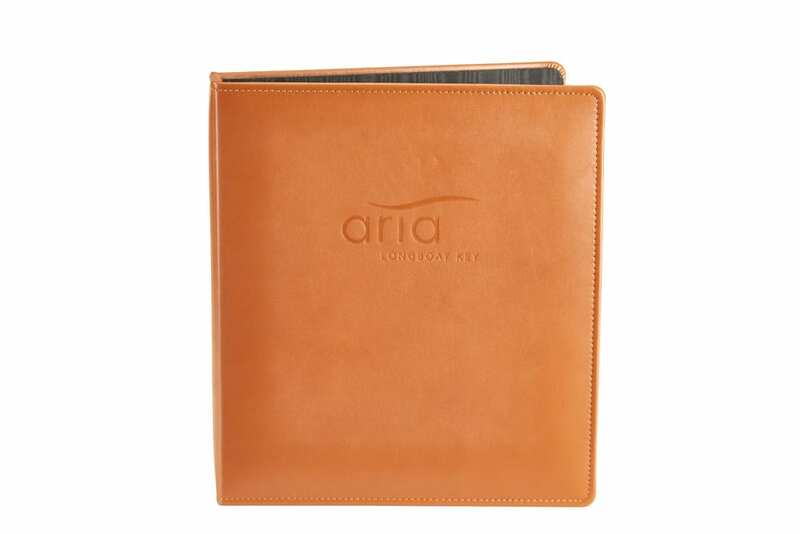 Fully padded cover and silk moire liner provide a distinguished look. 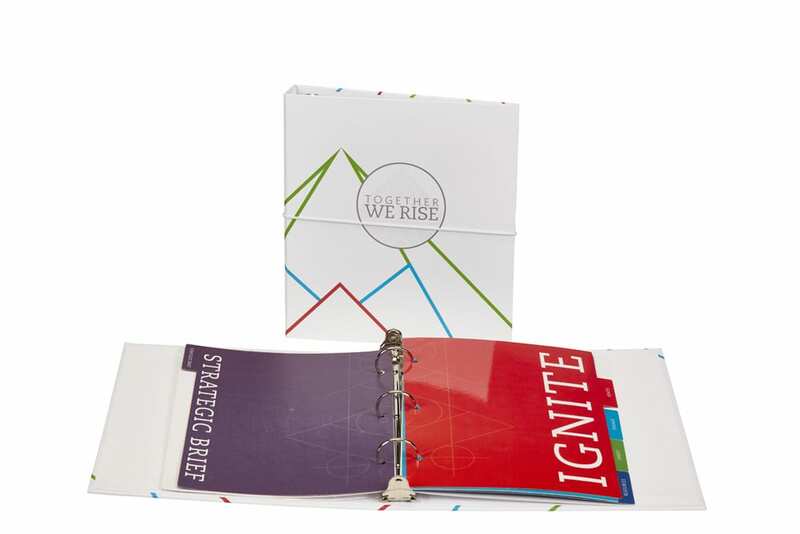 Continuity of the brand is illustrated using three different binders. Turned & stitched full grain leather and imitation leather as well as a heat sealed version. All with the same gold foil logo treatment for use in client presentations. 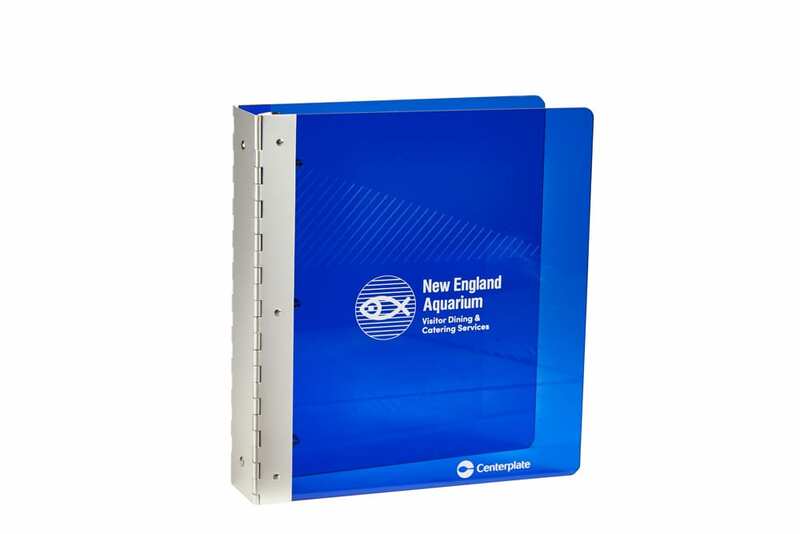 Euro-scored binder 4-color printed and gloss laminated both inside and outside for durability. The multi-scored spine presents a contemporary look. 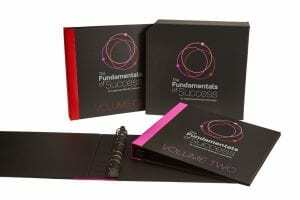 Turned edge slipcase and two turned edge binders with multi-ring metals. Black cloth with 4-color silkscreen on slipcase and binder. The quarter bind on each of the binders is a pms match to the artwork on the covers. The multi-ring metal is matte black. 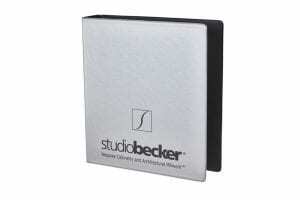 Flip-over easel binder made from expanded/supported imitation leather with matte silver foil stamp/deboss decoration. 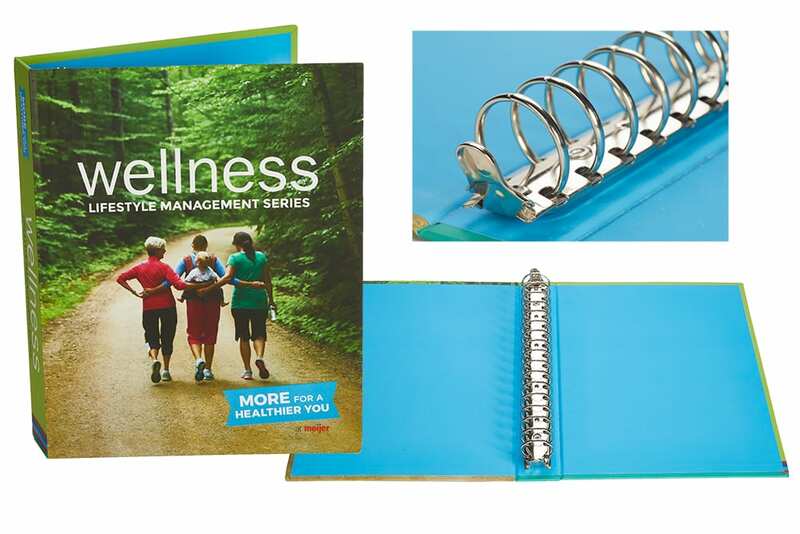 Heavy-duty rings provide durability for heavy laminated presentation pages. 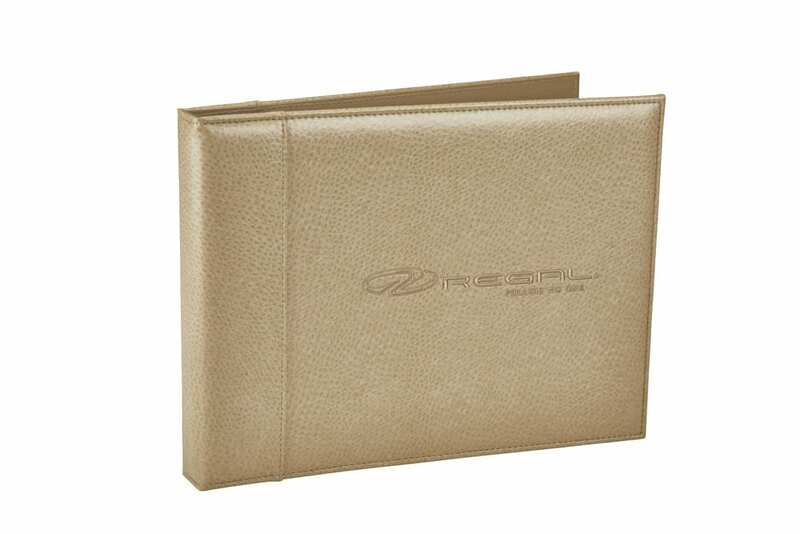 Unique ostrich supported upholstery material covers a turned & stitched binder with an embroidered logo provides on the front. A stylish and impressive presentation. 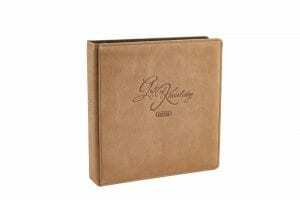 Turned & stitched imitation leather folio with padded covers. 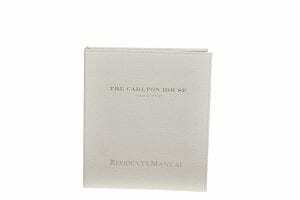 Debossed and clear filled design that wraps the cover and silk moire liner and inside pockets to hold a wire-o bound booklet. Turned edge with rounded corners in-room directory. 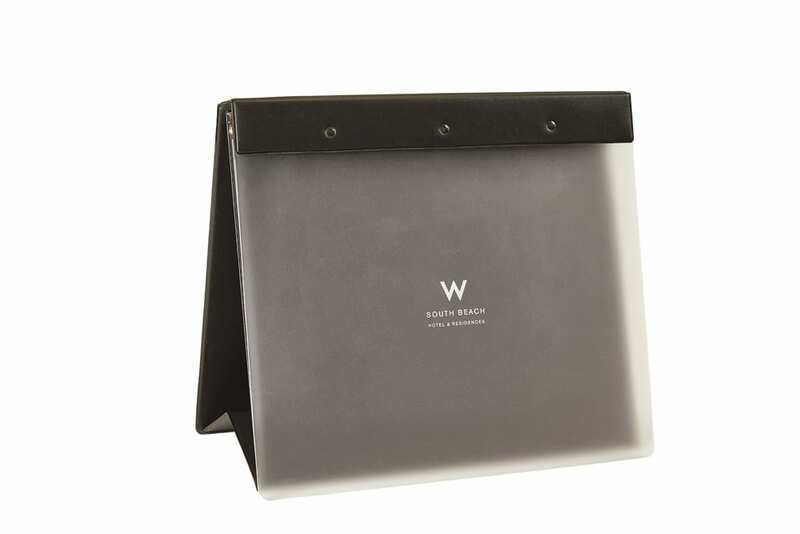 Made from cloth with a wrap-around design silkscreened in clear ink for a subtle resort logo display. Upscale in-room documentation provided in full grain belting leather with the logo blind deboss on the front cover. The snap closure holds the materials in place. 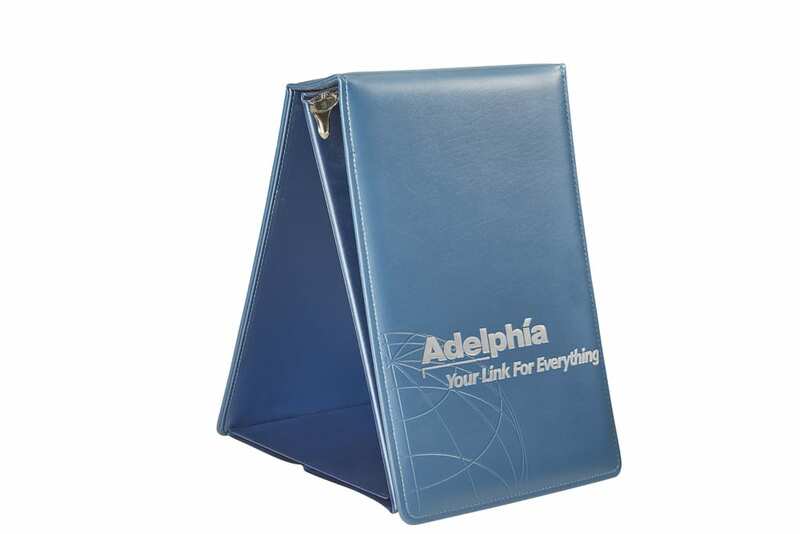 Three-ring binders are still the standard for holding printed materials. 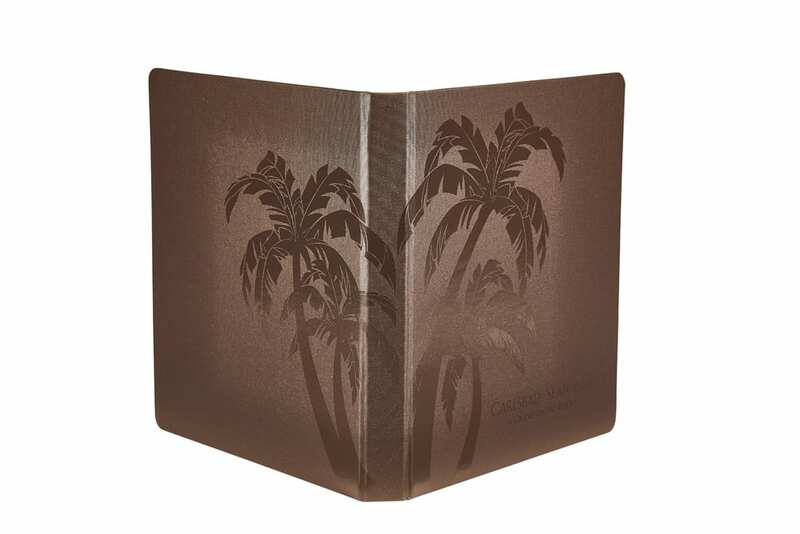 Silver suede vinyl has the logo silkscreened in black on the front cover and spine. 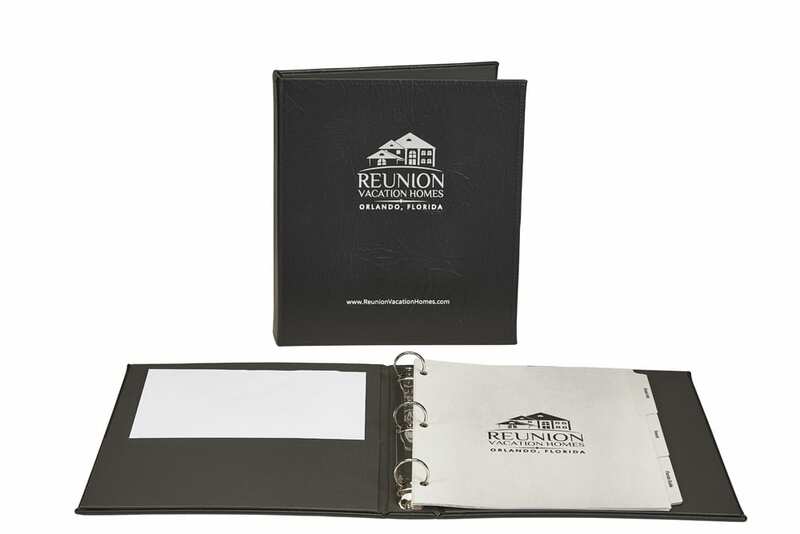 Lining the binder with black vinyl to match silkscreen on front cover gives this binder a professional presentation. 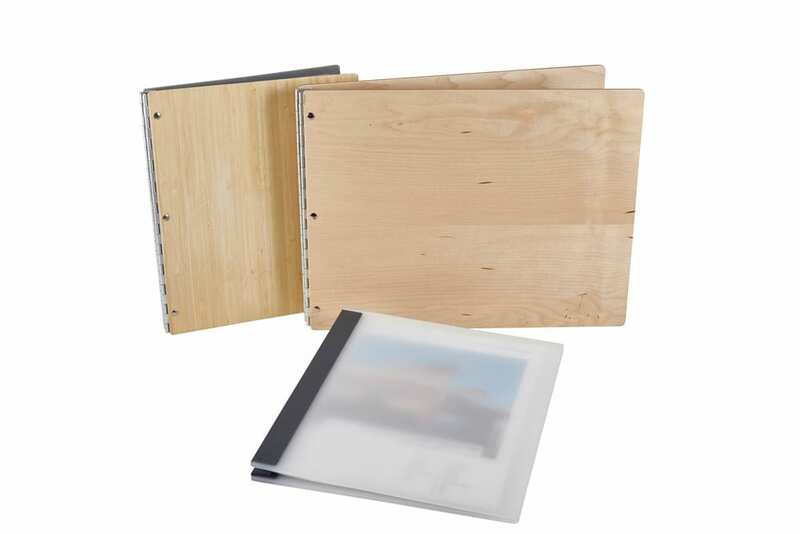 Special oversized wood presentation books with piano hinges. Covers can be laser etched or screened. 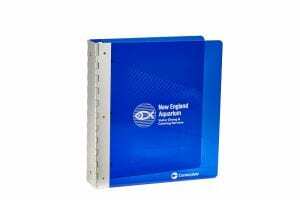 Letter size folio has a metal quarter bind with frosted acrylic covers. Covers can be silkscreened or laser etched. 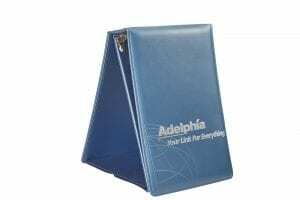 Seal/cut 8.5” x 5.5” sheet size room directory binder. Padded front and back and logo blind deboss in front cover. Top grain leather turned & stitched 3-ring binder with rounded corners. Black silk moire French turned panels lining inside. Logo is blind deboss on front cover. 4188: 4-color print + gloss lamination on 16 pt. coated stock. 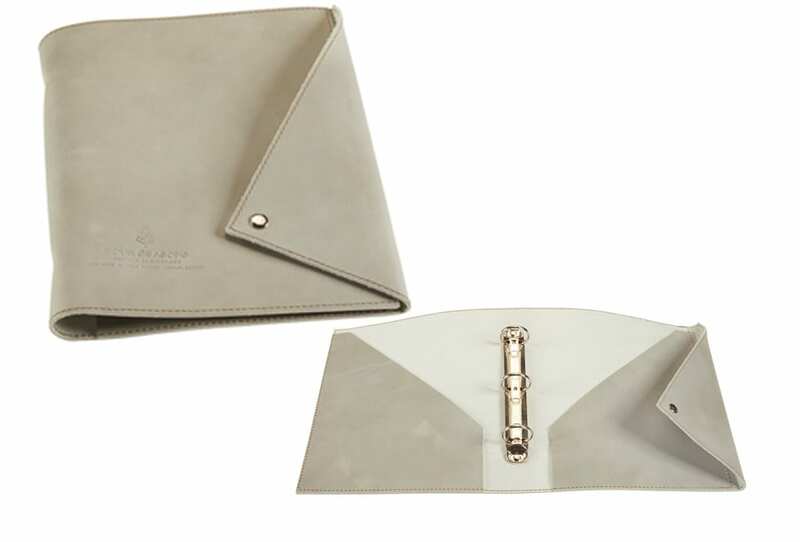 Horizontal pockets inside front and back cover. Turned and stitched 3-ring binder made from expanded/supported imitation leather with square corners, French turned clothe panels lined. 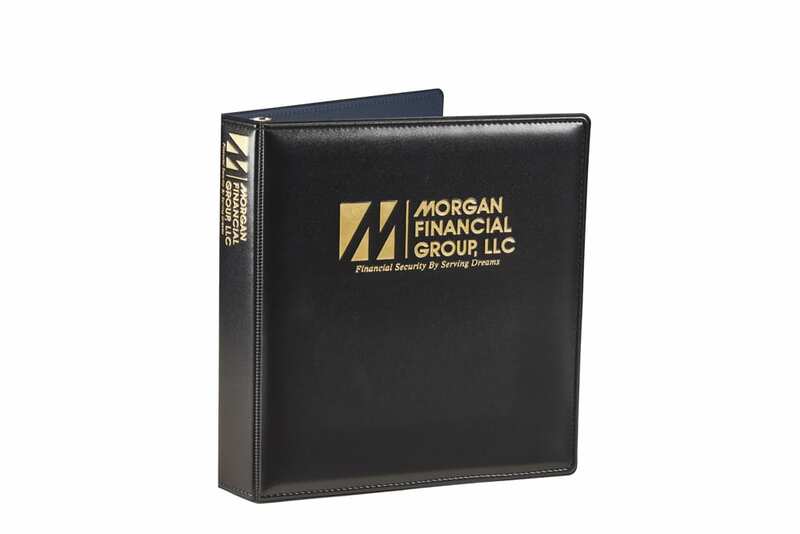 Turned edge pocket inside front lid and custom index tabs printed with logo on each tab sheet. 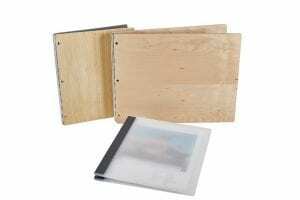 Tabs are mylar reinforced and the pages are 3-hole drilled and mylar reinforced as well for durability. 4-color process + gloss film laminated 3-ring binder. 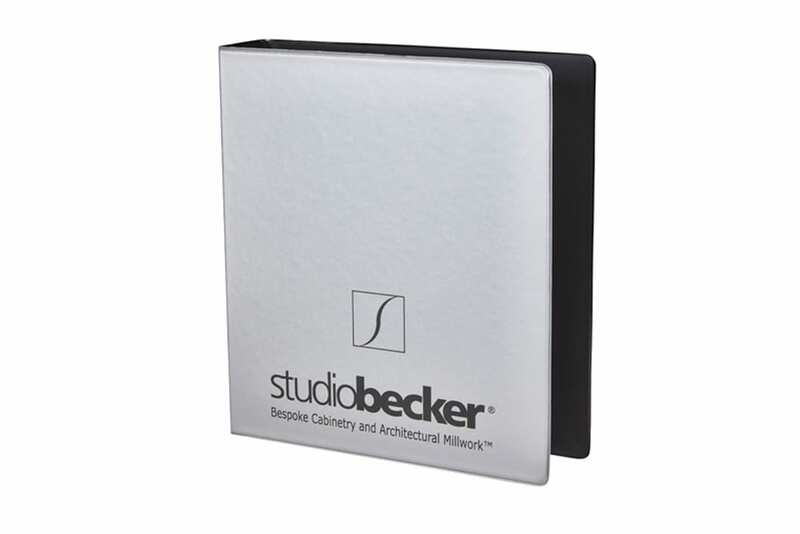 Turned & Stitched imitation leather 3-ring binder with square corners. 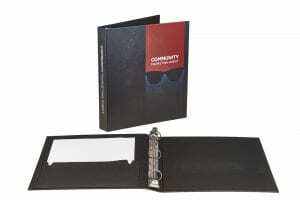 Inside are custom poly index tabs and horizontal pockets. 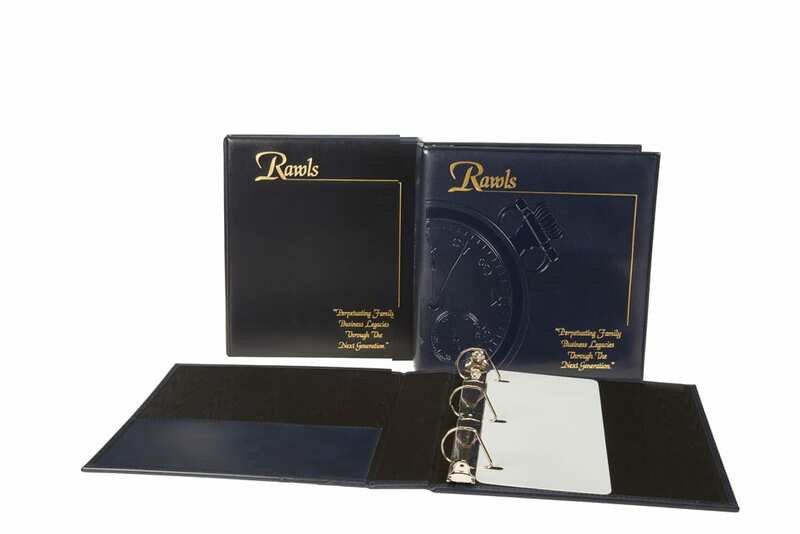 Seal/cut binder made of expanded/supported imitation leather. The logo is screened and deboss and the logo mark is a blind deboss in a wrap-around design from front cover, spine and back cover. 4-color printed + soft touch laminate cover and liner. Multi-ring metal. Turned edge 3-ring binder with square corners. Imitation ostrich supported material for outside and lined with French turned cloth material. Horizontal pocket inside front cover. Logo is silver foil stamp/deboss on front cover.